"Your Furniture Store in Indianapolis, IN "
Furniture Discounters has three of the most popular and now most "Viral" stores in Indianapolis, Indiana - since the launch of the EDBassMaster fully integrative marketing campaign launched in Q4 of 2011. Since their launch, they have been expanding their brand, developing their business, and building a number of new stores to be fully operational in 2013. They feature a variety of brands like Ashley Furniture, Seta, Simmons Coaster, Catnapper and continue to be the first choice for furniture based on their discounted prices and friendly staff! 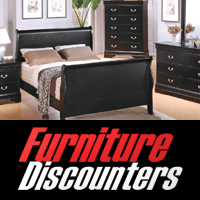 In late 2011 Furniture Discounters reached out to GenerationYM. They were looking to expand their marketing into New Media to see if it would help boost store traffic, sales, and create a more enjoyable experience for their customers. So Furniture Discounters contracted comedians Ed Bassmaster and Jack Vale to create a video series of pranks done in their store, pranking their customers and scheduled a meet and greet. The videos they produced in the store totalled at around 3 million views all together, that month Furniture Discounter doubled their sales goals, with record breaking in-store and online traffic. 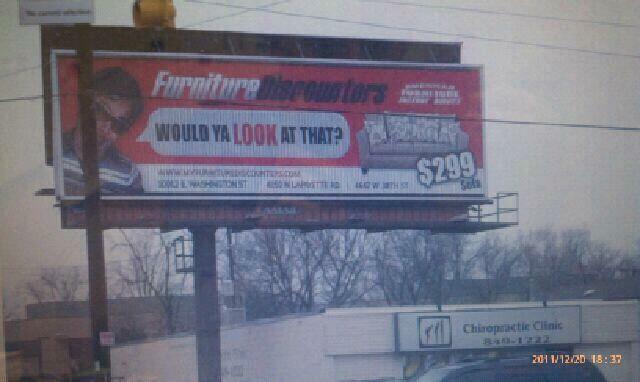 Furniture Discounters wanted to create a powerful, funny, edgy and eye catching billboard. The concept was challenging because we wanted to leverage the success of the viral videos, but we also wanted to make it appealing to those who didn't know Ed Bassmaster or hadn't seen his pranks. So we decided to go with the idea of a mock of the billboard world, with a very forward message like "Don't Just look at it, BUY IT". The graphic concept was to have Ed with a funny pose, his signature line, and incorporate a picture of a couch and logo so people would recognize it was for a furniture store in the area. We used Furniture Discounters powerful colors red, black and white.